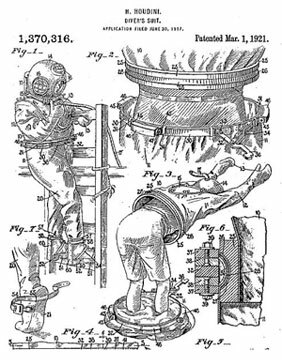 Houdini also held a patent for a style of diving suit. The innovation was granted U.S. Patent Number 1,370,316 on March 1, 1921. The object of Houdini’s diving suit was to allow a diver to get out of the suit while submerged. This helped the diver swiftly and safely escape and reach the surface of the water. It also allowed a diver to don his suit without assistance. This was accomplished by being formed in two halves, with a locking joint in the middle. The diver could reach this joint and release it, and then escape from the suit. When America went to war, Houdini was too old to join the army so he helped the war efforts in other ways. 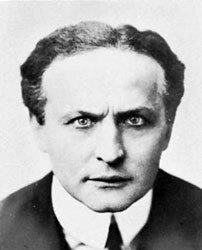 Besides selling war bonds and supporting the Red Cross, Houdini taught classes to soldiers on how to escape from German handcuffs and jails. The diving suit was also another way for Houdini to support US troops. The invention was in response to concerns from the Navy that a diver couldn’t escape from his suit and perform a free accession if he had problems with his air compressor, had a flooded hood or became entangled and because of this soldiers were losing their lives. Unfortunately, the idea never became popular due to an increased risk of a flooded suit.